Happy Halloween from WGT, enjoy these treats on us! 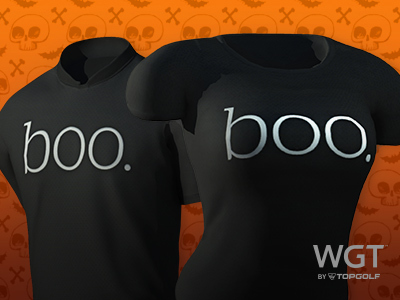 Log in and play today (10/31) and we'll give you this limited edition Boo T-Shirt and 50 hits of the new Halloween Ball Effect -- both free! It doesn't matter whether you log in to wgt.com or WGT Golf Mobile, you'll still receive both items and can use the ball effect wherever you play WGT. To wear your new shirt (or the other Halloween items, including pumpkin heads and a hockey mask! ), just log on to WGT Golf Mobile and edit your apparel. *Special offer valid 10/31/18, log in to WGT and get a free limited edition Boo T-Shirt (you’ll get both male and female versions, to match the avatar you have equipped) and the new Halloween Ball Effect (50 hits). We've just released some updates to the game, including some new upcoming tournaments and a reminder about special Halloween items for you to celebrate with this week! "Heeeheheehee!" Happy Halloween Week from WGT! 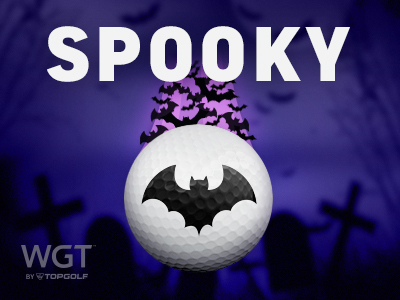 Get into the spirit with the new, limited time Halloween Ball Effect to add a spooky purple vapor trail with flying bats, plus a cackle from our in-house WGT witch to all your shots. 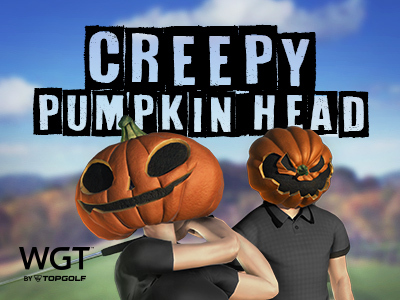 Play WGT Golf Mobile and get the new, limited time Halloween apparel items to give your opponents a scare! 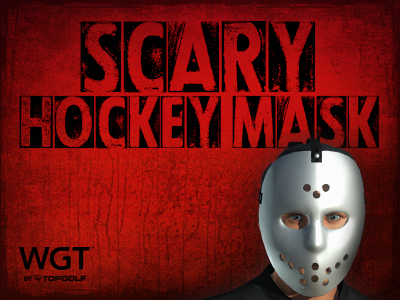 Get your head on straight with a new Creepy Pumpkin Head or a Scary Hockey Mask – both available now in the Pro Shop! You’ll get both male and female versions, to match the avatar you have equipped. Starting 11/1, compete in the Bethpage Black Classic as part of the 2018 WGT Virtual Tour. Post your first round score between 11/1-11/25 to qualify for the single-play second round (11/26-11/30), and the top 70 combined scores in each Pro-Champion tier will split the total purse prize of 100,000 WGT Credits. With Halloween coming up quickly, be sure to get your avatar geared up and ready to go for the occasion! Give all your shots some spooky flair with the new, limited time Halloween Ball Effect, featuring a purple vapor trail of flying bats and a cackle from our very own WGT witch – yes, really. Dress up your avatar this week too with limited time apparel items on WGT Golf Mobile. 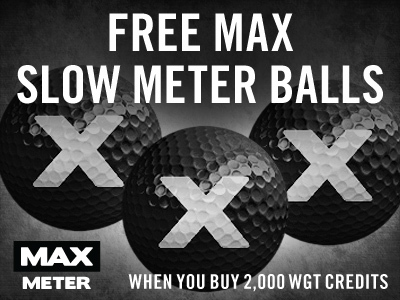 Get 3 free MAX Slow Meter balls today when you buy 2,000 or more WGT Credits. Slow down your swing meter with these player-favorites, then maybe use some of your new credits to add a spooky ball effect to your shots -- just in time for Halloween! *Special offer for players that buy 2,000 or more WGT Credits today through tomorrow (10/25/18-10/26/18), receive 3 MAX Slow Meter virtual golf balls (Hack+). *Offer valid on one 2,000 or more WGT Credit purchase only during the promotion. Don't be afraid to join this week's CC Event #84 to get you prepped for Halloween. 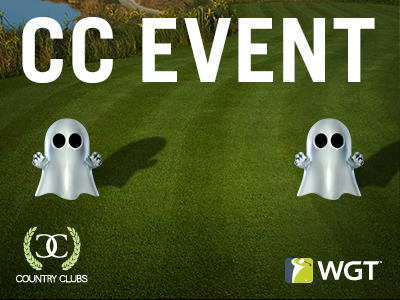 Today through Fri, 10/19, compete with your WGT Country Club to win these floating ghost tee markers and flags -- we're pretty sure it's a friendly ghost! 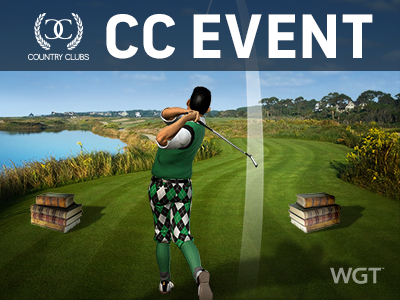 CC Event #84 runs 10/18-10/19 with multiple 4-hour Clashes, so be sure to play as many games as you can for your club and keep your eyes on the leaderboard. 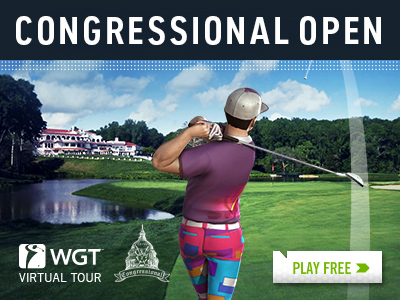 Join this month's Virtual Tour tournament on Congressional for a chance to win WGT Credits! The Congressional Open is the first in the Oct-Dec Quarterly Season, featuring a 100,000 credit prize. Compete in the unlimited play first round (10/1-10/26) followed by a single-play final round (10/27-10/31), with the top 70 combined scores in each Pro-Champion tier splitting the total purse. It's scary story time here at WGT! Compete now in CC Event #83 through Fri, 10/5 with your country club for your chance to win these stacks of vintage books (aka: tee markers and flags). CC Event #83 runs 10/4-10/5 with multiple 4-hour Clashes, so be sure to play as many games as you can for your club and keep your eyes on the leaderboard.